A virtual network device is a virtual device that is defined in a domain connected to a virtual switch. A virtual network device is managed by the virtual network driver, and it is connected to a virtual network through the hypervisor using logical domain channels (LDCs). Note - A guest domain supports up to 999 virtual network devices. A virtual network device can be used as a network interface with the name vnetn, which can be used like any regular network interface and configured with the Oracle Solaris 10 ifconfig command or the Oracle Solaris 11 ipadm command. Note - For Oracle Solaris 11, the devices are assigned generic names, so vnetn would use a generic name, such as net0. You can add a virtual network device to a domain, set options for an existing virtual network device, and remove a virtual network device by using the ldm add-vnet, ldm set-vnet, and ldm rm-vnet commands, respectively. See the ldm(1M) man page. See the information about Oracle VM Server for SPARC networking for Oracle Solaris 10 and Oracle Solaris 11 in Figure 12 and Figure 11, respectively. An LDC channel would be assigned between the virtual network devices and the virtual switch device. An LDC channel would be assigned between each pair of virtual network devices that are connected to the same virtual switch device (inter-vnet). The inter-vnet LDC channels are configured so that virtual network devices can communicate directly to achieve high guest-to-guest communications performance. However, as the number of virtual network devices in a virtual switch device increases, the number of required LDC channels for inter-vnet communications increases quadratically. You can choose to enable or disable inter-vnet LDC channel allocation for all virtual network devices attached to a given virtual switch device. By disabling this allocation, you can reduce the consumption of LDC channels, which are limited in number. By not assigning inter-vnet channels, more LDC channels are available for use to add more virtual I/O devices to a guest domain. Note - If guest-to-guest performance is of higher importance than increasing the number of virtual network devices in the system, do not disable inter-vnet LDC channel allocation. You can use the ldm add-vsw and the ldm set-vsw commands to specify a value of on, off, or auto for the inter-vnet-link property. By default, the inter-vnet-link property is set to auto, which means that inter-vnet LDC channels are allocated unless the number of virtual networks in a particular virtual switch grows beyond the default maximum limit specified by the ldmd/auto_inter_vnet_link_limit SMF property. The default ldmd/auto_inter_vnet_link_limit value is 8. If more than the maximum number of virtual networks are present for a virtual switch, the inter-vnet LDCs are disabled. See Determining What Networks Are Present in Logical Domains. If binding a guest domain or adding virtual networks to a bound domain results in the number of virtual networks in the virtual switch exceeding the limit, the inter-vnet LDCs are disabled automatically. The reverse is true. If unbinding a guest domain or removing virtual networks from a bound domain results in the number of virtual networks in a virtual switch being less than the limit, the inter-vnet LDCs are enabled automatically. When inter-vnet-link=auto, the ldm list output shows the value as on/auto or off/auto depending on the active state of inter-vnet links for the virtual switch. Note that when you upgrade your system to Oracle VM Server for SPARC 3.4, your inter-vnet-link value is preserved. The following figures show typical virtual switches when inter-vnet-link=on and inter-vnet-link=off, respectively. The following figure shows a typical virtual switch that has three virtual network devices. The inter-vnet-link property is set to on, which means that inter-vnet LDC channels are allocated. The guest-to-guest communications between vnet1 and vnet2 is performed directly without going through the virtual switch. This figure also represents the case where inter-vnet-link=auto and the number of virtual networks connected to the same virtual switch is less than or equal to the maximum value set by the ldmd/auto_inter_vnet_link_limit SMF property. The following figure shows the same virtual switch configuration with the inter-vnet-link property set to off. The inter-vnet LDC channels are not allocated. Fewer LDC channels are used than when the inter-vnet-link property is set to on. 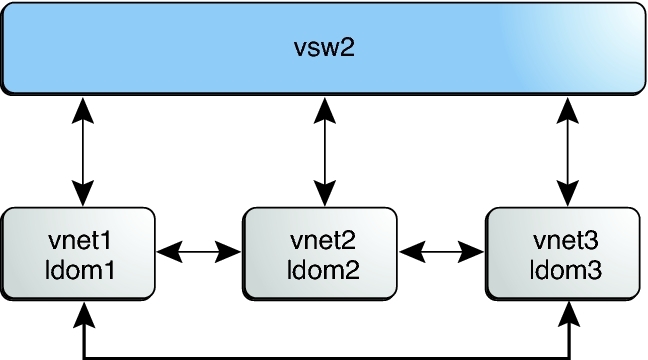 In this configuration, guest-to-guest communications between vnet1 and vnet2 must go through vsw1. This figure also represents the case where inter-vnet-link=auto and the number of virtual networks connected to the same virtual switch exceeds the maximum value set by the ldmd/auto_inter_vnet_link_limit SMF property. Note - Disabling the assignment of inter-vnet LDC channels does not prevent guest-to-guest communications. Instead, all guest-to-guest communications traffic goes through the virtual switch rather than directly from one guest domain to another guest domain. For more information about LDC channels, see Using Logical Domain Channels. You can issue commands from the OpenBoot PROM (OBP) prompt to list network information for logical domains.